Microsoft has said that they will begin selling a 250 gigabyte hard disk drive addon to the Xbox 360 in Japan, starting on March 11th. The drive is priced at 15,540 yen, which converts to approximately $170, and it is the first time that Microsoft will be selling the large capacity drive as a standalone product. Previously, the only way to get 250 gigabytes of storage on your Xbox 360 was to buy it bundled with a game, such as the Modern Warfare 2 bundle. 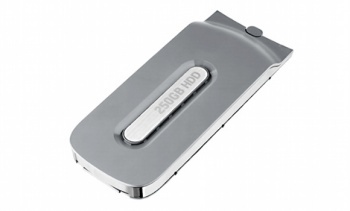 There is no word from Microsft on whether the 250gb drive will be available for purchase in other regions. According to the translated announcement, Microsoft is releasing two other products in Japan on March 11th: a black wireless 360 controller packed with 4 arcade titles (Geometry Wars 2, Lumines Live, Bomberman Live and Pac-Man: Championship Edition) and Microsoft's wireless N adapter, which was released in North America back in November.